During the day most of us have times when we hit the wall of hunger, and one of those is around teatime. It’s a long time since lunch and still some time to go until our evening meal, which is why we crave a little something to tide us over. This is perhaps where tradition for afternoon tea derives from. This mid afternoon snack became popular in the 1840s, and Anna, Duchess of Bedford, is credited with coming up with the idea of sating those hunger pangs with some tea and cake. Afternoon tea became all the rage and is still served across the country, in village tearooms and five star hotels. Nowadays, most of us don’t have time to whip up those baked teatime treats we remember from our childhood, but thanks to cake delivery services, we can still carry on that delicious tradition and enjoy a slice of freshly made cake and a cup of tea to stop our tummies rumbling all afternoon. 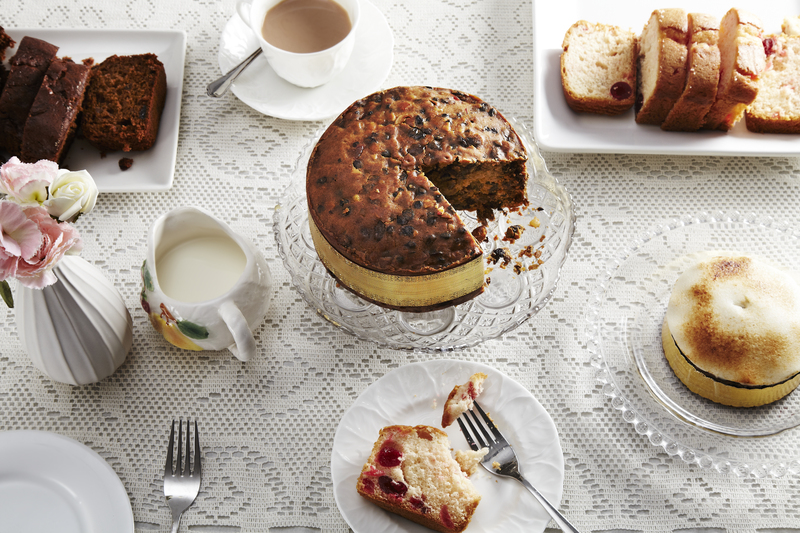 Tea Loaf Cake, a richly fruited light sponge cake, is a traditional teatime treat. There are many variations on this cake, such as the Welsh bara brith and Irish barmbrack, but nowhere is more famous for Tea Loaf Cake than Yorkshire. Here it is made with a mixture of currants, raisins, cherries and mixed peel, all steeped in black tea to create a soft, moist and incredibly moreish cake. The perfect way to enjoy a Yorkshire Tea Loaf Cake is sliced with plenty of butter – an ideal snack to enjoy with your afternoon cup of tea. Rich, dark, sticky and warm with spice, Ginger Loaf Cake can trace it origins back to the Spice Islands of the West Indies. The fiery spice is tempered by the luscious sweetness of black treacle, to create a sophisticated and deliciously moist cake. In our version chewy raisins are studded to add bursts of juicy sweetness. Eat it sliced with a cup of tea, or even a tot of rum or whiskey to warm your cockles on a cold day, or warm it up and serve with custard or cream as a delicious dessert. When you think of a rice cake, you probably imagine the desiccated discs of puffed rice you can get in your local supermarket, but when we talk about Northumbrian Rice Loaf Cake we mean something much more mouthwatering. This North Country delicacy was traditionally served during the festive season, as a lighter alternative to rich Christmas cake. This light sponge cake is baked using ground rice, to give it a unique, chewy texture. While it might be associated with the festive season, a slice of this old favourite makes the perfect partner for afternoon tea at any time of year, or you can warm it up and serve it with cream or ice cream, for a more indulgent treat. Nothing beats a wedge of farmhouse fruit cake to satisfy your hunger. Whether it’s Rich Fruit Cake, stuffed full of dried fruits, spices and dash of booze, or Yorkshire Dales Fruit Cake studded with cherries and sweet citrus jewels of mixed peel, these are the ultimate teatime treats. Pair them with tea, coffee or even a wedge of British cheese, and you’ll be set up for the rest of the day. These are just a few of the delicious teatime treats we bake everyday to offer the real taste of traditional Yorkshire farmhouse cakes. Our cakes are based on family recipes passed down through generations of farmer’s wives and use the best ingredients and time honoured techniques to deliver that genuine homemade flavour. You can discover our full range of cakes and buy them for home delivery at our online shop to bring a taste of Yorkshire to your tea table.